Tuesday, February 12, at 7 p.m., Three Sisters Historical Society (TSHS) presents Warm Springs tribal elder Wilson Wewa, who will fill the FivePine Conference Center with stories of the Northern Paiute history and lifeways around Sisters Country with his program, "We Are From This Land: Northern Paiute Presence in Central Oregon." The second Fireside Stories Evening of the year will be preceded by the society's meeting at 6 p.m., with the doors opening for members at 5:45 p.m. For those coming only to hear Wewa, the doors will open at 6:30 p.m.
Wewa is the great-great-grandson of two of the most powerful and important chiefs in Northern Paiute history, one being Chief Paulina. Wewa was born to Wilson (Jazzy) Wewa and Eugenia Wolf on the Warm Springs Indian Reservation, where he was raised. As a child he spent countless hours hearing the stories of his family, tribe, and past lifeways as they pertained to his life. He graduated from Madras High School in 1974. In his youth, Wewa traveled extensively with his family, especially his grandmother, to other parts of the Great Basin where he met many other Northern Paiute elders whose stories of healing, singing, legends, and ceremony added to his knowledge of his people. It was during that time the elders recognized Wewa's potential as a student of the Washat - the faith of a majority of the plateau tribes along the Columbia River. True to the elders' early assessment of Wewa, he is a prominent member, spiritual leader, and oral historian of the Northern Paiute tribe of Oregon. He has also served on the Warm Springs Tribal Council. Wewa's grandmother, Maggie Wewa, who lived to the age of 107, was beloved by Wewa and had a big influence on his spirituality. As leader of the Longhouse spiritual center, Wewa is called on to travel far and wide to tribal gatherings, to act as an orator, storyteller, and funerary officiant. He is the last Northern Paiute leader to continue to sing the burial songs of his people. In his travels throughout the ancient Great Basin homeland of the Paiutes, he gains additional insights into the interface of Paiute history and homeland, spirituality, and legends. Wewa said that he is the last enrolled tribal member who speaks Paiute, out of fewer than 100 total speakers of Northern Paiute. Since 1980, Wewa has worked with senior tribal members as the Senior Wellness Coordinator for the Confederated Tribes of Warm Springs. 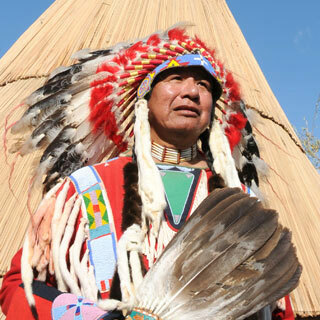 He is also consulted by other tribes and organizations in the United States on elders' issues. More recently, he was invited as a guest lecturer to the College of William and Mary in Virginia to speak on Native American issues that related to health, spirituality, environment, and treaty rights as they pertain to water and land. He also works with the University of Oregon and Oregon State University as a consultant on Northern Paiute history and ethnobotony. In 2017, after five years of work with his collaborator, James Gardiner, Wewa's book, "Legends of the Northern Paiute," was published. The book shares and preserves 21 original and previously unpublished Northern Paiute legends that were originally told around the fires of Paiute camps and villages during the "storytelling season" of winter. They were shared with Paiute communities as a way to pass on tribal visions of the "animal people" and the "human people," their origins and values, their spiritual and natural environments, and their culture and daily lives. Each legend was recorded, then read and edited out loud, to respect the creativity, warmth, and flow of Paiute storytelling. The stories selected for inclusion include familiar characters from native legends, such as Coyote, as well as intriguing characters unique to the Northern Paiute, such as the creature embodied in the Smith Rock pinnacle, now known as Monkey Face, but known to the Paiutes in Central Oregon as Nuwuzoho the Cannibal. The historical society's first Annual Meeting will be held at 6 p.m. in the FivePine Conference Center prior to Wewa's presentation at 7 p.m. The meeting is open to all current supporters. Admission to Wewa's presentation is free for TSHS current members and $10 general admission for non-members. Memberships will be available that evening.